Pittsburgh Penguins general manager Jim Rutherford has a well-earned reputation for wheeling and dealing during an NHL season. 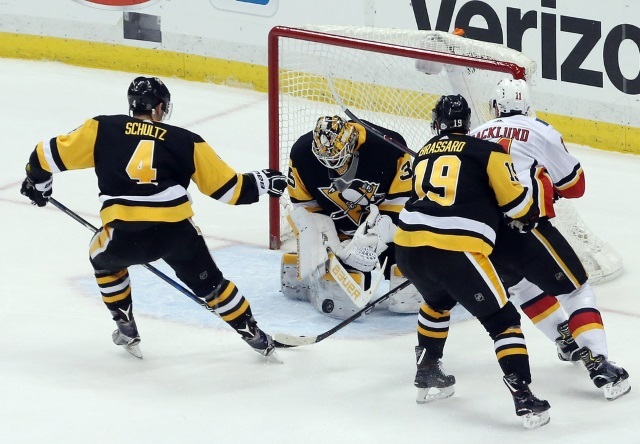 Justin Schultz, Trevor Daley, Carl Hagelin, and Ron Hainsey were in-season acquisitions crucial to the Penguins’ Stanley Cup championships in 2016 and 2017. Of those four, Schultz is still with the team. Over the course of 2017-18, Rutherford added current roster players Derick Brassard, Jamie Oleksiak, and Riley Sheahan. This season, he traded for left wing Tanner Pearson and defenseman Marcus Pettersson and recently sent center Derek Grant to Anaheim for center Joseph Blandisi. With the Feb. 25 NHL trade deadline only five weeks away, there’s little reason to doubt Rutherford could have another move or two up his sleeve. Brassard, acquired near last season’s trade deadline, is once again the subject of media trade chatter. An unrestricted free agent this summer, the 31-year-old center might not fit into the club’s long-term plans. Last week, The Athletic’s Josh Yohe noted Rutherford acknowledged Brassard’s on-ice struggles this season. Yohe believes he could be retained for the remainder of the season or packaged with a surplus defenseman for a third-line center. Yohe’s colleague Aaron Portzline reported the Blue Jackets had inquired about Brassard. Other speculation links him to the San Jose Sharks. Last Thursday, Rutherford told the Pittsburgh Post-Gazette‘s Jason Mackey he didn’t know where the trade chatter about Brassard was coming from. He also cautioned not to link the Grant-for-Blandisi trade to Brassard. Nevertheless, conjecture over the center’s future in Pittsburgh will likely grow. Rutherford also has two other potential assets to shop in the coming weeks. On Jan. 13, Mackey noted the Penguins’ recent re-signing of backup goalie Casey DeSmith could make third-stringer Tristan Jarry an attractive trade candidate. The imminent return of Justin Schultz from a broken leg will leave the Penguins with nine roster defensemen. Mackey suggested Oleksiak could be moved in part to shed his $2.13-million salary-cap hit. A veteran two-way center, a physical third-pairing defenseman, and a promising young goaltender could be attractive bargaining chips for Rutherford in the trade market. Brassard to the Blue Jackets seems unlikely given their status as a division rival. Sending him to a Western Conference club would be a better idea. The Sharks, however, might not be a good fit as they don’t have a center available to hope the Penguins. The Winnipeg Jets could also use depth at center but, like the Sharks, they don’t have what the Penguins need right now. Rutherford could send Brassard to the Sharks or Jets for a draft pick, then bundle Oleksiak and Jarry to a non-contender for a center. Shedding Brassard and Oleksiak would free up over $5 million in cap space for other additions near the deadline. The Chicago Blackhawks need defensive and goaltending depth and could be willing to move Artem Anisimov or Marcus Kruger. If Rutherford prefers bigger rental targets, the Ottawa Senators’ Matt Duchene or the New York Rangers’ Kevin Hayes could become available. If the St. Louis Blues drop out of playoff contention, perhaps they’ll entertain offers for Brayden Schenn, who’s signed through 2019-20 with an annual cap hit of $5.125 million. It remains to be seen what Rutherford has in store as the deadline nears. Based on his recent trade record, however, don’t expect the Penguins GM to stand pat.